Greetings crafty friends! Hope you are having a great week. 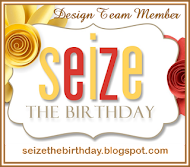 At Seize the Birthday this week, we are trying something that is new for me - inlay die cuts. Not sure why I haven't done this before. I really like how this turned out! I'm currently trying to use up older fabulous paper that I have been hoarding - think it works perfectly with the bold inlay sentiment. Hope you get a chance to play along with us this week. Check out the blog for all the details on how to play along. Give some love to our Special Party Guest, Rahamat, and the rest of the design team. Have a terrific day and wonderful weekend. Always appreciate your comments! Thanks for stopping by. Nice! I like the black pearl to balance the sentiment. I agree, inlaid die cuts look great. I completely agree - the bold font of the sentiment looks gorgeous on the wonderful pattern paper! Neither overpowers the other - just the right balance! And that one single pearl - how did you ever decide to place it there - just perfect!! Those colors work so well together Glenda! Great card!! HUGS! Oh the bold font looks fabulous against the BG, great card Glenda! This looks great, Glenda! Love the patterned paper with the pop of black. 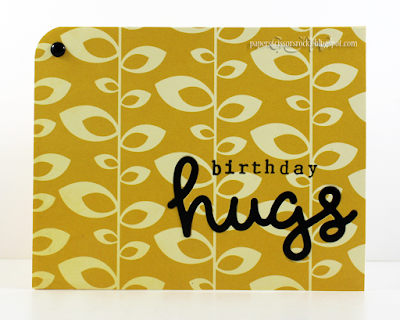 Love the retro look of the patterned paper in combination with black! Great choice! Papers and Scissors - for my crafts... Rocks - for my profession - geologist and all around science geek! All content, including text and photographs are © G.J. Wyatt. They are provided as inspiration, but not for publication, submissions, or other personal gain, etc. Thank you! Simon Says Stamp Challenge - Washi Tape! This is a Flickr badge showing public photos and videos from Glenda J. Make your own badge here. Share book reviews and ratings with Glenda J, and even join a book club on Goodreads.